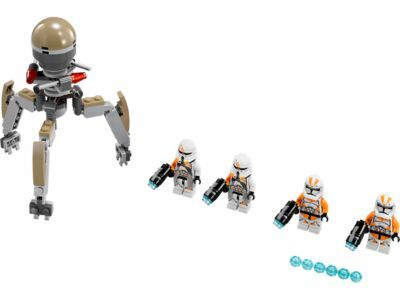 Help the 212th Battalion Clone Troopers take on the Octuptarra Tri-Droid with the LEGO® Star Wars™ Utapau Troopers™ battle pack. But watch out! With a rotating head, poseable legs and 3 flick missiles, the dangerous Tri-Droid is more than a match for the Clone Troopers! Includes 4 minifigures with weapons: 2 212th Battalion Clone Troopers™ and 2 Airborne Clone Troopers™. The Utapau Troopers™ (75036) Lego set is no longer directly available from the sites below. However, 3rd party partners of these sites might still have the set available. Alternate description Build the LEGO® Star Wars™ Utapau Troopers™ battle pack with 212th Battalion Clone Troopers™, Airborne Clone Troopers™ and a Tri-Droid.